We had our photo taken on the plane today. All five of us sat in a row and all happened to be using technology. One of us was creating a movie, one editing photos, two were reading books and one was building a hotel in Minecraft. Seat-24A-lady reclined her chair as far as it could go, lent through the gap to try and quietly take a photo but the shutter-noise gave her away. Protective of our family, I gave her a look and in broken English said she was interested that we were all using technology and would I mind a photo. So, now a total stranger has a photo of our family. I find that odd. Incidentally, the children gave our choice of Quito guest house a two or three out of ten. A bit harsh, but matching sheets and our own bathroom might have increased the score. 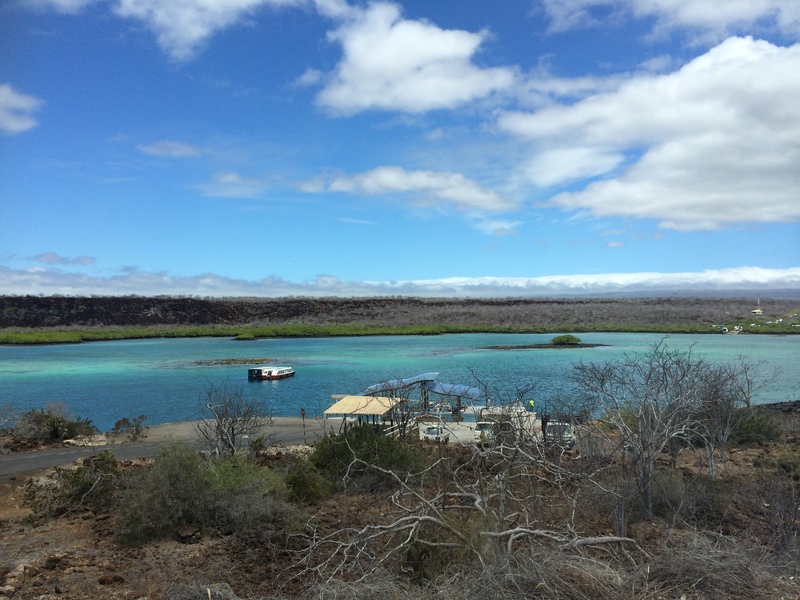 Today we travel to The Galapagos. We decided against a pre-booked cruise or land tour (to lower costs and increase our length of stay) and instead opted to go solo. We booked flights via Skyscanner and accommodation via Airbnb. We bought one way tickets and 7 nights accommodation has been secured in Santa Cruz. Our next commitment is a flight from Quito to Lima in 15 days time, so we just need to meander our way back in time for that. A relatively short flight from Quito via Guayaquil and we land in Baltra, one of the islands north of Santa Cruz to be met by ‘Freddy’ a contact picked up at the ‘two or three out of ten guest house’. On exit we clearly don’t fit the usual demographic. The airport is full of backpackers in their twenties as they all watch our family walk by – seeing children outside of term time is clearly a curiosity. They are strict on what we bring onto the islands to help preserve the national park. The plane cabin is sprayed, our hand luggage is x-rayed for contaminates on arrival and we walk through a more tasteful version of the council swimming pool foot bath – black wet rubber mats, so discrete, you may not even notice. I cannot describe this place. Our eyes are in sensory overload. The terrain is like nothing I’ve ever come across before. 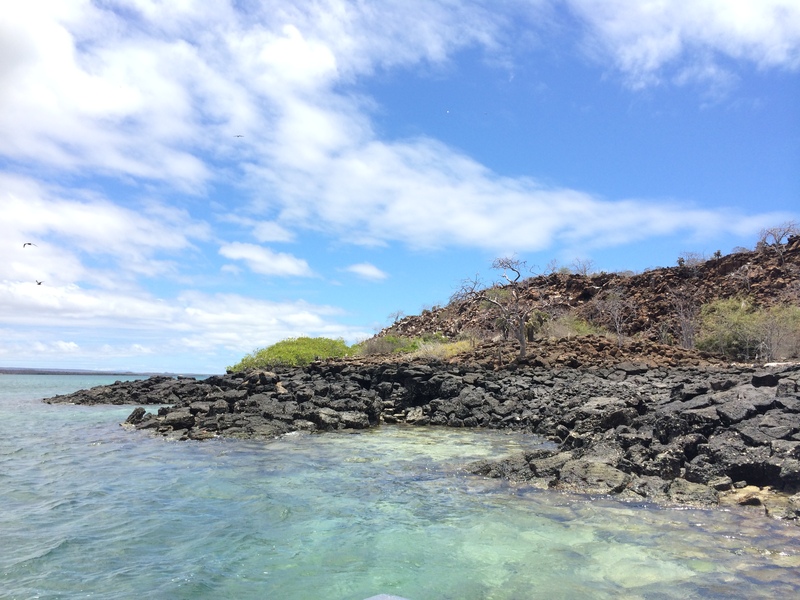 Red earth, grey grass, bright green cactus plants, turquoise sea, crisp blue sky, black rocks, red rocks, white trees, orange and black iguanas. Then you reach the towns – much less exciting. The bus stops abruptly to let a huge iguana cross the road (I swear, I’m not making this up). Then a further quick swerve to avoid three cows. Within our first thirty minutes we have seen stunning vibrant landscapes, crabs, iguanas, cows, several brightly coloured small birds, herons, pelicans. I’m already wondering how the rest of the trip can top this. As first impressions go, this is pretty impressive. You will need to pay $100 + $10 entry fee (each adult, $60 for children) on arrival. They only take cash. It can go from burning hot sun to rain within an hour. Wear sunblock and pack a rain coat every day. Definitely bring rain covers for your backpacks – they are usually thrown in the back of open trucks and on top of boats – they will get wet. Try to get hold of the arrival forms (two types) before arrival as they take forever to complete. Kids refillable water bottle – probably left in the taxi in Quito.